The Howard County Council recently passed a bill introduced by the Kittleman administration to upgrade and enhance the seven year old Office of Environmental Sustainability (OES). The vote was unanimous. This is the result of a thorough assessment of the effectiveness of the OES over the past seven years during Ken Ulman’s Democratic administration and the important role it will play in Allan Kittleman’s Republican administration. It is a clear sign that the County Council and the new administration value its role in the county. 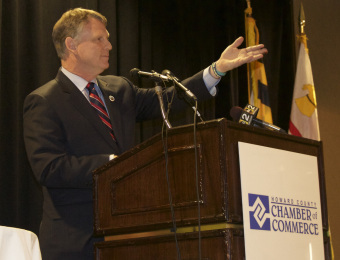 “And here’s a word you’re going to hear a lot from me over the next four years — sustainability” said new County Executive Allan Kittleman during his first State of the County Address at Turf Valley. It was a major theme of his remarks. This was a pleasant surprise since there were some voices during the campaign that disparaged the OES. However, Kittleman and his transition team quickly recognized its tactical value and envisioned that the OES can provide an important role by helping him balance the often competing needs of environmental, social, and economic issues that arise in most major decisions that need to be made by the county. All of these issues are important and need to be taken into account in the governing process. In the legislation, the Office of Environmental Sustainability has been renamed the Office of Community Sustainability (OCS) to reflect its broader mission. In addition to keeping most of the staff, the goal of the OCS is to expand its focus to include agricultural and economic considerations. These have been part of the process in the past, but will have more attention paid to them in the future. The goal is to have the OCS help evaluate policy options, coordinate experts from across the government departments, and bring in consultants as needed so that thorough assessments can be made in a timely manner. The Environmental Sustainability Board made up of citizens will continue to work closely with the Office and advise the County Executive and Council as appropriate. The OCS will continue to pursue two of its main efforts to date: energy and stormwater management. The county is expected to continue its energy efficiency efforts, reducing energy use at all of its facilities. It will also continue to take full advantage of state and federal grants to incentivize alternative energy projects across the county. The office will continue to pursue stormwater management projects and encourage landowners across the county to reduce the contamination that runs off their properties. The county also plays an important role in saving the places we love and like to visit. Land preservation is important to agriculture, nature’s invaluable eco-services, and our health. I am hopeful that even more land will be identified for preservation. The Office has been tasked to find more and better ways to keep our agricultural farms healthy and prosperous. I look forward to continued support for all of our parks and for some of the outdoor gems in our community: Mt Pleasant, Belmont, Robinson Nature Center, Middle Patuxent Environmental Area, Blandair, and Symphony Woods. OES, now OCS, has played a key outreach role in educating our citizens and in coordinating volunteer efforts such as tree planting and trash pickup efforts. They maintain an excellent website that lists many community events of interest to our citizens at www.LiveGreenHoward.com. I look forward to the administration continuing their efforts to get us all, citizens, government and the business community alike, working together to improve the quality of life here in Howard County. I would also like to thank the executive and council members for their leadership and commitment towards the invaluable environmental resources in our community. By nedtillman2 in Backyards, Energy, Farmlands on March 11, 2015 .